id Software boss says the future is not about graphical detail. John Carmack, the technical visionary whose gaming engines brought us Doom, Quake, and RAGE, is not interested in the potential power of next-gen consoles. Instead, he thinks that technology has reached a point where it doesn't hold back game designers anymore, and that the next graphical leap is not an important issue, since the only meaningful output is higher visual fidelity. "Any creative vision that a designer could come up with, we can do a pretty good job representing on current generation and certainly on PC," he said. "In many ways I am not all that excited about the next generation. It will let us do everything we want to do now, with the knobs turned up." Carmack believes that the current direction of console makers is misguided, and the focus needs to shift elsewhere, as the hardware race between Sony and Microsoft won't make much difference. He also provides Nintendo as an example of why graphical processing power is no longer key - the Wii possessed a mere tenth of the processing power of the other two systems, yet enjoyed incredibly healthy sales figures due to its innovative control scheme. So what should we be getting excited about in the not-too-distant future? 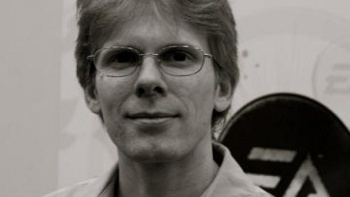 According to Carmack, his money is on Virtual Reality gaming, with a potential tie-in to the mobile market. He predicts that "in a couple years, we hope that instead of being tethered to a PC, you build it off mobile-phone hardware, an iPhone 5 or whatever. No wires, you use the cameras for optical positioning and then you can walk around. You can set up your arena and play in Virtual Reality." Sony has expressed interest in the concept, although it will likely be some time before consumers will see anything less than giant head mounted displays. If it is as easy as Carmack says, it will be interesting to see how id Software's upcoming titles fare on next-gen platforms.